Nitrous oxide, also known as dinitrogen oxide or dinitrogen monoxide, is a chemical compound with the formula N2O. Under normal conditions of room temperature and pressure, it is a colorless, nonflammable gas, with a pleasant, slightly sweet odor. 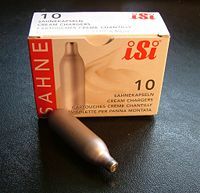 It is commonly known as laughing gas because of the euphoric effects of inhaling it. In the atmosphere, it acts as a potent greenhouse gas. Based on its properties, this chemical has diverse applications. For instance, it is used in surgery and dentistry for its anesthetic and analgesic effects. It is an aerosol spray propellant in cooking sprays and whipped cream canisters. It can serve as an oxidizing agent in rocket engines, and it can significantly increase the power output of automobile internal combustion engines, as the gas is introduced into the intake tract. In the 1790s, Humphry Davy tested the gas on himself and some of his friends, including poets Samuel Taylor Coleridge and Robert Southey. They soon realized that nitrous oxide considerably dulled the sensation of pain, even if the inhaler were still semiconscious. Later, it came into use as an anesthetic, particularly by dentists, who typically do not have access to the services of an anesthesiologist and may benefit from a patient who can respond to verbal commands. The nitrous oxide molecule (N2O) is a linear chain of three atoms: a nitrogen atom bound to a second nitrogen atom that in turn is bound to an oxygen atom. The structure may be conceptualized as a resonance hybrid of N=N+-O- and -N=N+=O. Nitrous oxide is isoelectronic with carbon dioxide. It can be prepared by heating ammonium nitrate in the laboratory. It can be used to produce nitrites by mixing it with boiling alkali metals, or to oxidize organic compounds at high temperatures. Nitrous oxide is commonly made by heating ammonium nitrate. This method was developed by the French chemist Claude Louis Berthollet in 1785 and has been widely used ever since. Unfortunately, the method poses a potential risk of explosion by overheating ammonium nitrate. The addition of various phosphates favors formation of a purer gas. This reaction occurs between 170 - 240°C, temperatures where ammonium nitrate is a moderately sensitive explosive and a very powerful oxidizer (perhaps on the order of fuming nitric acid). At temperatures much above 240 °C the exothermic reaction may run away, perhaps up to the point of detonation. The mixture must be cooled to avoid such a disaster. In practice, the reaction involves a series of tedious adjustments to maintain the temperature within a narrow range that it does not naturally stay in. Professionals have destroyed whole neighborhoods by losing control of such commercial processes. Examples include the Ohio Chemical debacle in Montreal in 1966, and the Air Products & Chemicals disaster in Delaware City, Delaware, in 1977. Higher oxides of nitrogen are formed as impurities. Note that uncatalyzed ammonia oxidation (i.e. combustion or explosion) goes primarily to N2 and H2O. The Ostwald process oxidizes ammonia to nitric oxide (NO), using platinum; this is the beginning of the modern synthesis of nitric acid from ammonia. Nitrous oxide can be made by heating a solution of sulfamic acids and nitric acids. A lot of gas was made this way in Bulgaria (Brozadzhiew & Rettos, 1975). There is no explosive hazard in this reaction if the mixing rate is controlled. However, as usual, toxic higher oxides of nitrogen are formed as well. Colorless solutions of hydroxylamine hydrochloride and sodium nitrite can also be used to produce N2O. 8-gram canister of nitrous oxide. Nitrous oxide (N2O) is a dissociative drug that, when inhaled, can cause analgesia, euphoria, dizziness, flanging of sound, and slight hallucinations. In the 1800s, nitrous oxide was used by dentists and surgeons for its mild analgesic properties. Today, nitrous oxide is used in dental procedures to provide inhalation sedation and reduce patient anxiety. In small doses in a medical or dental setting, nitrous oxide is very safe, because the nitrous oxide is mixed with a sufficient amount of oxygen using a regulator valve. However, extended, heavy use of inhaled nitrous oxide has been associated with Olney's Lesions. Since the earliest uses of nitrous oxide for medical or dental purposes, it has also been used recreationally, because it causes euphoria, slight hallucinations and, in some cases, potential aphrodisiac effects. Only a small number of recreational users (such as dental office workers or medical gas technicians) have legal access to pure nitrous oxide canisters that are intended for medical or dental use. Most recreational users obtain nitrous oxide from compressed gas containers which use nitrous oxide as a propellant for whipped cream, from small canisters of nitrous oxide which are intended for use with whipped cream dispensers, or from automotive nitrous systems. Automotive nitrous available to the public has trace amounts of sulfuric compounds added to prevent recreational use. The sulfur additives only impart an unpleasant taste and odor to the gas, without diminishing the effects of the gas in any manner. The gas is approved for use as a food additive (also known as E942), specifically as an aerosol spray propellant. Its most common uses in this context are in aerosol whipped cream canisters, cooking sprays, and as an inert gas used to displace staleness-inducing oxygen when filling packages of potato chips and other similar snack foods. The gas is extremely soluble in fatty compounds. In aerosol whipped cream, it is dissolved in the fatty cream until it leaves the can, when it becomes gaseous and thus creates foam. Used in this way, it produces whipped cream four times the volume of the liquid, whereas whipping air into cream only produces twice the volume. If air were used as a propellant, under increased pressure the oxygen would accelerate rancidification of the butterfat, while nitrous oxide inhibits such degradation. However, the whipped cream produced with nitrous oxide is unstable, and will return to a more or less liquid state within half an hour to one hour. Thus, the method is not suitable for decorating food that will not be immediately served. Nitrous oxide can be used as an oxidizer in rocket engines. Its advantages over other oxidizers are that it is nontoxic, and, given its stability at room temperature, easy to store and relatively safe to carry on a flight. Nitrous oxide can also be used in a monopropellant rocket. In the presence of a heated catalyst, N2O will decompose exothermically into nitrogen and oxygen, at a temperature of approximately 1300° Celsius. In a vacuum thruster, this can provide a monopropellant specific impulse (Isp) of as much as 180s. While noticeably less than the Isp available from hydrazine thrusters (monopropellant or bipropellant with nitrogen tetroxide), the decreased toxicity makes nitrous oxide an option worth investigating. In vehicle racing, nitrous oxide (often referred to as just "nitrous" in this context, to differentiate it from the acronym NOS used for the brand Nitrous Oxide Systems) is sometimes injected into the intake manifold (or prior to the intake manifold; some systems directly inject right before the cylinder) to increase power. The gas itself is not flammable, but it delivers more oxygen than atmospheric air by breaking down at elevated temperatures, allowing the engine to burn more fuel and air, resulting in more powerful combustion. Nitrous oxide is stored as a compressed liquid, the evaporation and expansion of liquid nitrous oxide in the intake manifold causes a large drop in intake charge temperature, resulting in a denser charge, further allowing more air/fuel mixture to enter the cylinder. The lower temperature can also reduce detonation. The same technique was used during World War II by Luftwaffe aircraft with the GM 1 system to boost the power output of aircraft engines. Originally meant to provide the Luftwaffe standard aircraft with superior high-altitude performance, technological considerations limited its use to extremely high altitudes. Accordingly, it was used only in specialized planes such as high-altitude reconnaissance aircraft, high-speed bombers and high-altitude interceptors. One of the major problems of using nitrous oxide in a reciprocating engine is that it can produce enough power to damage or destroy the engine. Power increases of 25–300 percent are possible, and if the mechanical structure of the engine is not properly reinforced, the engine may be severly damaged or destroyed during this kind of operation. It is very important with nitrous oxide augmentation of internal combustion engines to maintain proper operating temperatures and fuel levels to prevent preignition, or detonation (sometimes referred to as knocking or pinging). Compressed nitrous oxide is stored at sub-zero temperatures. A leak or unexpected release of compressed nitrous oxide can result in immediate frostbite. Also, although it is normally inert in storage and fairly safe to handle, it can decompose energetically and potentially detonate if initiated under the wrong circumstances. Liquid nitrous oxide acts as a good solvent for many organic compounds, but liquid mixtures can form somewhat sensitive explosives. Contamination with fuels has been implicated in a handful of rocketry accidents, where small quantities of nitrous / fuel mixtures detonated, triggering the explosive decomposition of residual nitrous oxide in plumbing. In biological systems, nitrous oxide inactivates the cobalamin form of vitamin B12 by oxidation. Symptoms of vitamin B12 deficiency, including sensory neuropathy, myelopathy, and encephalopathy, can occur within days or weeks of exposure to nitrous oxide anesthesia in people with subclinical vitamin B12 deficiency. Symptoms are treated with high doses of vitamin B12, but recovery can be slow and incomplete. People with normal vitamin B12 levels have sufficient vitamin B12 stores to make the effects of nitrous oxide insignificant, unless exposure is repeated and prolonged (nitrous oxide abuse). Vitamin B12 levels should be checked in people with risk factors for vitamin B12 deficiency prior to using nitrous oxide anesthesia. Unlike other nitrogen oxides, nitrous oxide is a potent greenhouse gas; per unit of weight, it has 296 times the effect of carbon dioxide (CO2) for producing global warming. Nitrous oxide is thus part of efforts (such as the Kyoto Protocol) to curb greenhouse gas emissions. (Other nitrogen oxides affect global warming indirectly, by contributing to tropospheric ozone production during smog formation). Nitrous oxide also attacks ozone in the stratosphere, aggravating the excess amount of UV light striking the Earth's surface in recent decades (various freons and related halogenated organics also consume ozone in the stratosphere). Nitrous oxide is the main natural regulator of stratospheric ozone. Nitrous oxide is naturally emitted by bacteria in soils and oceans. Agriculture is the main source of human-produced nitrous oxide: cultivating soil, the use of nitrogen fertilizers, and animal waste handling can all stimulate naturally occurring bacteria to produce more nitrous oxide. The livestock sector (primarily cows, chickens, and pigs) produces 65 percent of human-related nitrous oxide. Industrial sources make up only about 20 percent of all anthropogenic sources, and include the production of nylon and nitric acid and the burning of fossil fuel in internal combustion engines. Human activity is thought to account for somewhat less than 2 teragrams of nitrogen oxides per year; nature, for over 15 teragrams. The global anthropogenic nitrous oxide flux is about 1 petagram of carbon dioxide carbon-equivalents per year; this compares to 2 petagrams of methane carbon dioxide carbon-equivalents per year, and to an atmospheric loading rate of about 3.3 petagrams of carbon dioxide carbon-equivalents per year. ↑ Nitrous oxide, N2O, should not be confused with the other oxides of nitrogen, such as nitric oxide NO and nitrogen dioxide NO2. ↑ Nitrous Oxide - Laughing Gas. School of Chemistry, University of Bristol. Retrieved May 31, 2007. ↑ J. R. Partington, A Short History of Chemistry, 3rd ed. (New York: Dover Publications, 1989), 110-121. 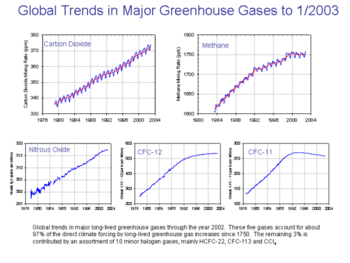 ↑ Climate Change 2001: Working Group 1: The Scientific Basis. Intergovernmental Panel on Climate Change. Retrieved May 31, 2007. ↑ Livestock’s long shadow: Environmental issues and options. vitalcentre.org. Retrieved May 31, 2007. ↑ Nitrous Oxide: Sources and Emissions. U.S. Environmental Protection Agency. Retrieved May 31, 2007. Cotton, F. Albert, Geoffrey Wilkinson, Carlos A. Murillo, and Manfred Bochmann. 1999. Advanced Inorganic Chemistry 6th ed. New York: Wiley. ISBN 0471199575. Eger, Edmond I. 1985. Nitrous Oxide N2O. Amsterdam: Elsevier Science. ISBN 0444008608. Langfield, Trevor. 2006. How to Build & Power Tune Nitrous Oxide Systems. Dorchester, UK: Veloce. ISBN 1904788890. Sheldin, Michael, David Wallechinsky, and Saunie Salyer. 1993. Laughing Gas: Nitrous Oxide, 2nd ed. Berkeley, CA: Ronin Pub. ISBN 0914171526. Nitrous Oxide. The Vaults of Erowid. This page was last modified on 6 December 2018, at 17:14.